A slightly different angle of “Self portrait” by Ron Mueck. I can barely get through a day in Houston—and even international art websites—without seeing Ron Mueck’s sideways head. An alumnus of Jim Henson’s creature shop and fastidious creator, Mueck depicts his uncanny, dead-eyed figures as larger than life, whether they fill an entire room or stand two feet tall. 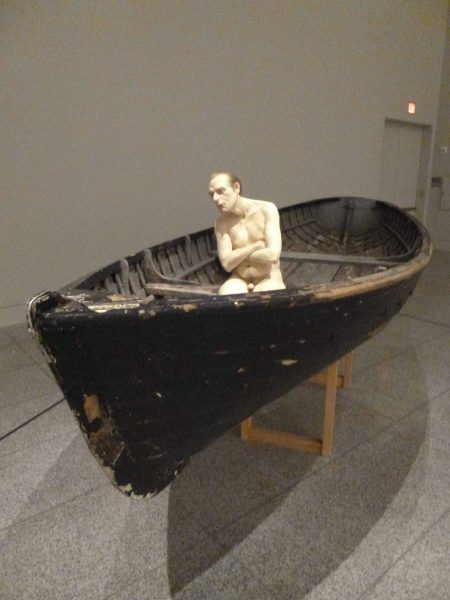 The 13 sculptures exhibited at the Museum of Fine Arts Houston (MFAH) through August 13 represent one third of Mueck’s oeuvre. On the other hand, the upstairs exhibition at the MFAH through May 21, “Adiós Utopia: Dreams and Deceptions in Cuban Art Since 1950,” has received mixed reviews, and much less publicity. 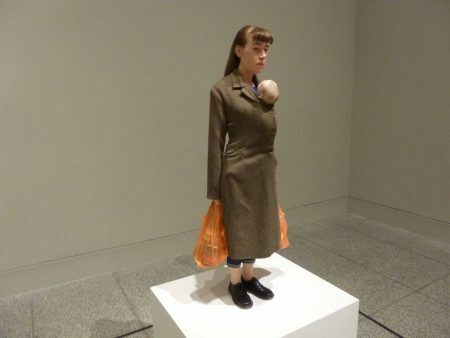 This is understandable: Mueck’s is a ticketed exhibition, even on Thursdays, when admission to the MFAH is free, and introduces rarely exhibited work. “Adiós Utopia” is a scattered retrospective of Cuban art from 1950 to present, ranging from concrete paintings to photographs to videoed street performances, with items from the MFAH’s collection as well as on loan from around the globe. 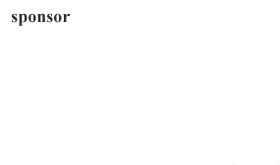 There is no reason to pit two exhibitions against each other just because they appear in the same museum. But experience is what curators work to create, and the unique sensations offered by each exhibit warrant an unbiased examination of both. Luckily, the MFAH has the space and scope to facilitate these different experiences. An everydayness pervades in Ron Mueck’s sculptures, oddly enhancing the grotesque and mundane. A teenage boy’s cargo shorts. A new, naked mother staring at the still-umbilically-connected baby on her chest. A “Youth” with a Christlike wound. A giant, mutilated chicken hanging from its feet—the only non-human subject. 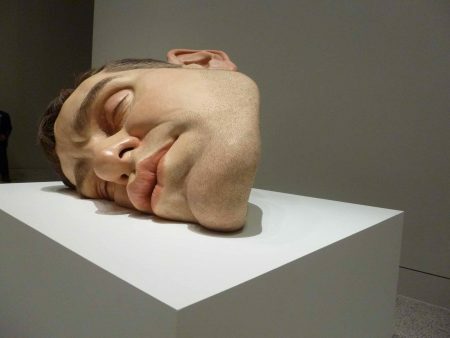 All are whole figures, except for Mueck’s disembodied self-portrait—the sideways, sleeping head, which is still realistic, just removed from the rest of itself. The only piece that removes itself from the everyday by mixing scales is “Man in Boat,” in which a small, naked man in a comparably huge rowboat sails toward his fate, eyes closed. This isn’t explicitly another self-portrait, but the man does bear some semblance to Mueck’s disembodied head. This voyage into the unknown, vulnerable to the elements and perhaps feeling smaller than life, is a fitting metaphor for life’s journey. Upstairs, “Adiós, Utopia” is a sprawling exhibit that requires more time and attention to traverse. Its ambitious goal is to capture different movements and media throughout the past 67 years, since communism’s rise to power in the island nation. I was excited to see this exhibit in light of newly opened U.S. relations with Cuba, particularly because in 2015, I interviewed a Cuban-American woman who escaped in 1959. When I asked her if she would consider going back, she said that the Cuba she knew was gone, and she could not forgive the violence that befell her country. The poetry in this exhibition’s full name—”Dreams and Deceptions in Cuban Art Since 1950”—promises to reflect a similarly complex story. That conflict of emotions is certainly present in individual pieces. Bright revolutionary posters, photographs, political cartoons and sculpture take on various points of Cuban identity in the past 67 years: Economic despair in the photographs of Ricardo G. Elias in the “Oro Seco” series (2005) document the deterioration of Cuba’s sugar industry—the titular “dry gold”—after the collapse of the Soviet Union. 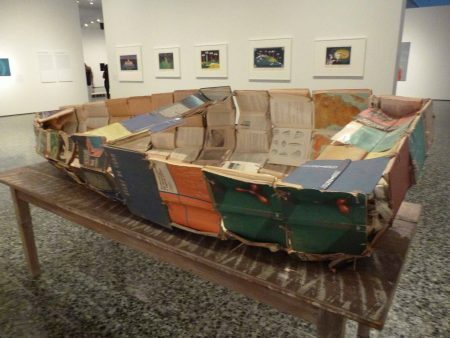 Commentary on being trapped both by water and lack of information is evident in Alexis Leyva Machado (Kcho)’s “Obras Escogidas (Selected Works),” a rowboat made of books that would disintegrate if it touched the sea. A video recording of Los Carpinteros’ “Conga Irreversible (Irreversible Conga),” a street performance wherein performers actually moved backward and wore black costumes rather than the traditional bright colors. While an accessible and upbeat treat for viewers, the performance also challenges socialism’s assertion that it is irreversible in the march of time, but most of Cuba’s everyday existence is trapped in the past. Still, the exhibit didn’t have a clear cohesion, despite efforts to section out the galleries by topic or medium instead of date. I can point to individual pieces that were powerful, but the main draw of this exhibit is more the historical information and context than the art itself. 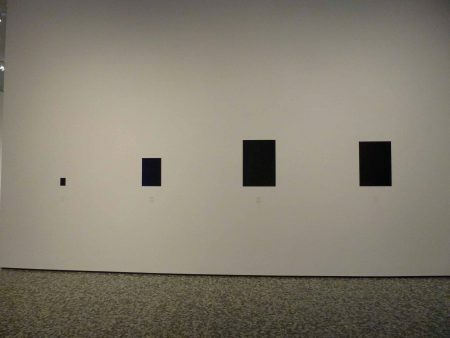 For example, learning about the history of geometric abstraction and concrete art in Cuba in the 1950s, as artists sought to find a more universal, utopian message in their work, was much more interesting than the paintings’ visual impact. 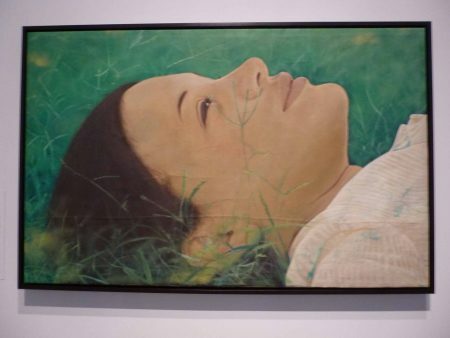 Take, also, “Ella está en otra dia (She is in another day)” by Flavio Garciendia, painted in 1975. A perfectly nice painting, although perhaps a little “Precious Moments,” which takes on new significance when we realize that photorealism was a direct challenge to the mandated “art as an arm of the revolution” viewpoint. 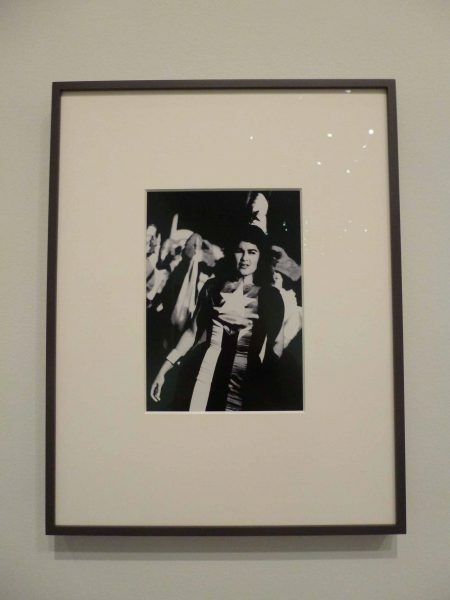 Furthermore, a portrait of a young girl directly challenged the halls of revolutionary heroes that stood sentinel against diverse styles and subjects and paved the way for the postmodernism of Cuba in the 1980s. 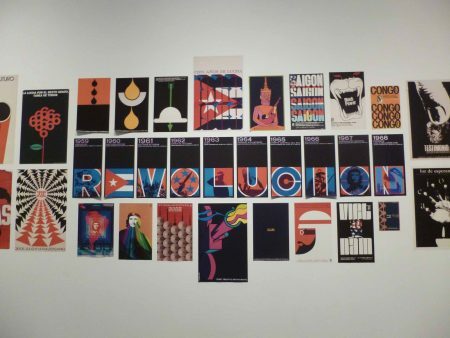 While not as immediately astonishing as the Mueck exhibition, I appreciated learning more about Cuba’s history through an artistic lens, and that is where the power of this exhibition lies. High points include work by Tania Bruguera, a stalwart of contemporary performance art and vocal advocate for immigrants’ rights and governmental transparency. Her “Estadistica (Statistic)” (1996-8), a Cuban flag woven of human hair, was one of two striking pieces that uses biological materials to illustrate the regime’s dehumanizing effects: Yoan Capote used human teeth to create Stress (in memoriam) (2004–12). From “Nueve leyes (Nine laws),” part of the “El peso de la historia (the weight of history)” series by Reynier Leyva Novo. The artist used software to calculate the volume of the characters used to type and handwrite key pieces of Cuba’s legislation. The two exhibitions are symbolically united in my mind by a sculpture in “Adiós Utopia” by Iván Capote, “Dislexia (Dyslexia)” (2003). The motorized arm clears away a line of text in a tray of obscuring industrial oil for a few seconds before the oil encroaches again: “Life is a text that we learn to read too late.” One could definitely imagine Mueck’s close-eyed figures having the same universal revelation in their frozen moments. The history, mystery, and fine detail surrounding these two exhibits are ultimately satisfying in different ways—just make sure to bring your reading glasses.